Dear Reader– I am soo torn. It all started over the summer when Aunt Mary introduced me to her fabulous “mary-nade”. It totally rocked my pork chop world. But THEN I tried Parmesan Pork Chops while doing an Early Bird Review for Gooseberry Patch’s Homestyle in a Hurry… and I am yet again hooked on another pork chop delight! Anyhoo, for this quick little recipe, you grab 1/4 cup of butter, melt it and set it aside. Now heat up 1/4 cup of oil in a skillet. Meanwhile take your chops and give those piggies a bath in your butter. Would you like to win Homestyle in a Hurry BEFORE it hits store shelves? There are tons of ways to enter to win in my giveaway, check it out! I am going to have to make that. I am always looking for new ways to cook Pork Chops. Thanks for doing the review! Does sound good…and a nice way to get off the sugar-go-round of the past two weeks! 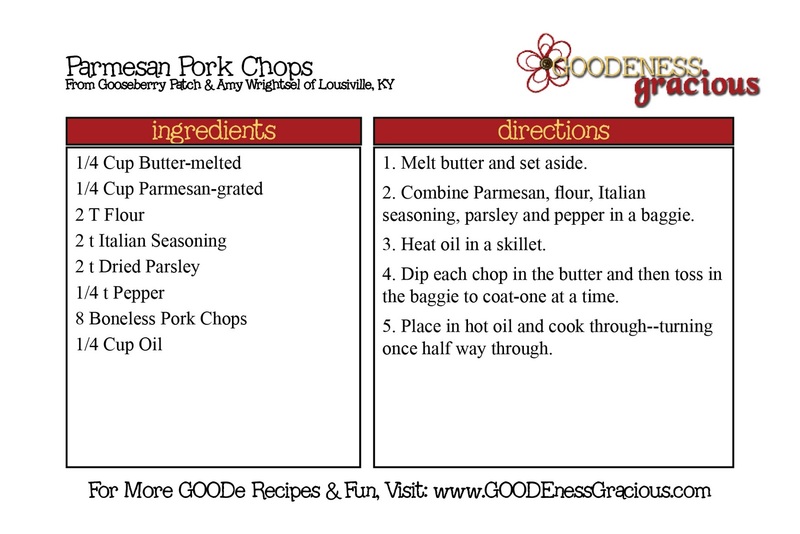 I love parmesan pork chops, and they are always a big hit around here.